Ok, I have been to Wales and have wandered through England and now I thought I had better go north of the border before I have to take my passport to get in. On this bitterly cold day I am featuring the world famous Sanguhar gloves, and believe you me – the claim to world fame is justified. 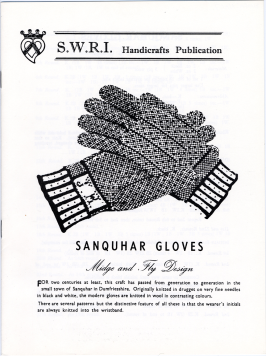 Try googling Sanquhar Gloves; you will be amazed how famous they are, particularly in Japan. Sanquhar, pronounced “Sankhar” is in Dumfriesshire on the Scottish/English border and with its valleys and the river Nith nearby it has always been the perfect place for sheep and associated wool-based industries. The craft of knitting came late to Scotland. The first knitters in Britain were highly paid craftsmen of the 16th and 17th centuries who tried to protect the secrets of their trade within corporations or guilds, but secrets will out and by the mid 1700s knitting had spread the length and breadth of England, Wales and Scotland (better get my history correct – no Britain back then) and knitting had developed into an important industry. Hotspots included the Yorkshire Dales, Dorset and Hampshire. By 1778 when a Mr. David Loch visited Sanquhar, knitting was already well established and the majority of the town used knitting to supplement the family income alongside their main employment. It was an ideal way to earn additional income as it required no expensive equipment and was eminently transportable. For these reasons, it is difficult to trace in historical records and it’s easy to overlook the importance of hand knitting to localised economy’s. By the late 1700′s hand knitting in Sanquhar and the surronding areas had begun to decline. Demand had been severely interrupted by revolutions and wars in America and Europe combined with competition from the newly invented and cheaper machine made garments. It was probably about now that the familiar two colour Sanquhar patterns were developed. It was unlikely that the earlier stockings and gloves were intricately patterned but by 1807 the stockings that were being produced were patterned. As the industry was not documented, the origins of the traditional patterns are obscure. Luckily for us, the development of these intricate patterns helped the hand knitting industry to survive, albeit on a much smaller scale. As people were still willing to pay for a beautifully made and distinctive item and so Sanquhar knitters rose to the challenge and developed their distinctive regional style. As I have said, how the individual patterns developed is unclear but Sanquhar patterns are very similar to knitting from the same period from the Yorkshire Dales, Westmoreland and Aberdeen and they share more than a passing similarity to knitting styles from Scandinavia and Afganistan. But it is impossible to know for sure if the patterns migrated into the area from somewhere else. It is not impossible that the patterns travelled from Scandinavia and geographically Yorkshire, Dumfriesshire and Westmoreland are all near enough to share a common thread. But it is also conceivable that the patterns developed in each region independently from each other. I think any links between the different areas could conceivably be more to do with the actual construction of the glove. More research on this is due I think!! By the 1830s hand knitting had ceased to exist as a business in Sanquhar but the regional traditions survived in the homes of the locals. The patterns were not written down but passed from generation to generation of knitters, still going under the original traditional names – The Duke, Rose, Trellis, Drum, Coronet, Glendyne, Midge and Flea, Shepherd’s Plaid and Prince of Wales or Fleur de Lyse. A sense of pride in the local knitting developed and resulted in the custom of a pair of Sanquhar gloves being presented to visiting dignitaries and also to the town’s Cornet, or leading horse rider, of the annual ceremony of the Riding of the Marches. 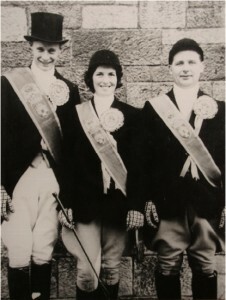 A custom when all the horse riders of Sanquhar ride around the boundaries of the burgh, led by the Cornet. Finally in the 1950′s people outside of the area begun to take an interest in regional variations of knitting and some patterns were written down and published by the Dundee magazine, The People’s Friend. 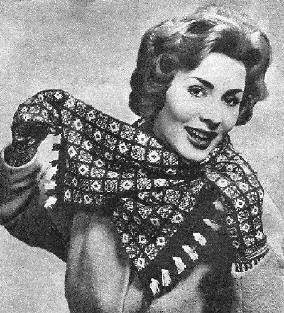 The Duke pattern also appears in commercial knitting leaflets of this period and in the mid 1960s the Scottish Women’s Rural Institute published a series of four knitting leaflets detailing the surviving traditional patterns (these are still available today, see below). 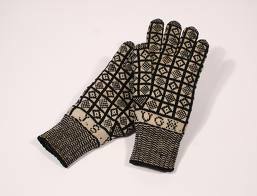 Nowadays, Sanquhar gloves are not made on any commercial basis but knitting as a leisure activity is huge, and the good old wide world web has meant people the world over have been able to come together to share their passion for traditional knitting. Ravelry is a great place to start if you want to find out more. I bet the inventor of the internet never envisaged it would enable traditional crafts to be shared, adapted and kept alive! The Scottish Womens Rural Institute has long been selling a pamphlet which has the basic glove in various traditional patterns. Here you can buy a kit with all you need to knit your own Sanquhar gloves. This one is for the dedicated knitters out there. Ravelry is an online knitters community. Sanquhar knitting has its very own group on theie forum where people discuss Sanquhar gloves and other traditional regional knitting, including Dales knitting! This entry was posted in Dumfries, Heritage Crafts, Textiles, Traditional Crafts and tagged gloves, knitting, sanquhar, traditional crafts. Bookmark the permalink.